In 1974 the Rijksmuserum acquired a bed cover and two matching pillow covers in a mixture of techniques characteristic of the late 16th and first half of the 17th century. 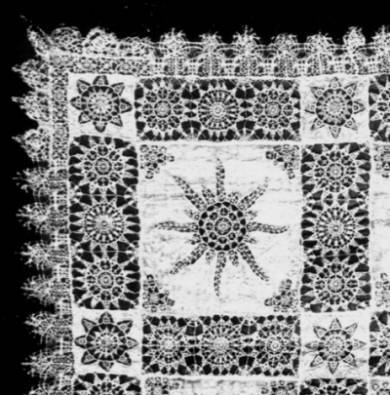 All three pieces are composed of large squares of fine linen with three different circular motifs in the same technique in the corners and between the large and small motifs wreaths or sprays of flowers in applied work in the same linen. The squares are joined together at the sides by three cutwork roundels or rosettes with small squares of linen with cutwork and applied work in the corners. 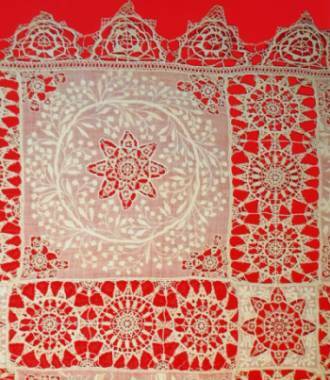 The cover is edged on three sides, the pillow covers allround with plaited bobbin lace. It was a great surprise to discover another item of exactly the same type in a lace exhibition held in the Allhallows Museum at Honiton in Devon in England. this piece is a cloth or cover for a table or cupboard. Dr. A.J. Spriggs, of whose collection it formaed part, acquired it in 1969 from a source in Paris. The Rijksmuseum's part also came from Paris, via a dealer there who made regular visits to the museum in the sixties and early seventies, so there is no reason to doubt that all four items originally constituted a set. In this specific application technique no other work appears to have survived. The technique was to appear again in an even finer form in the eighteenth century in the delicate white embroidery known as Dresden work, but there seemd to be nothing between that and this 17th-century set. It seems likely that the set was made for a marriage, it might even contain a clue to the bride's name: The daisy was at various times an attribute of Venus or a symbol of the Virgin Mary and the Incarnation, but it might also indicate that the bride was called Margherita. in 1599. To the left of the arms appears a daisy plant, an obvious allusion to the duchess's name. The bills of the seamstresses of the Stuart kings of England in the Great Wardrobe Accounts in the Public Record Offixce in London contain regular references to cutwork. Dorothy Speccart annually supplied James I (1566-1625, king of England from 1603) with one or two dozen night cappes wrought with cuttworke and edged with needleworke purle, while the bill of the lace merchant John Sheirston for the year from Michaelmas 1623 to Michaelmas 1624 shows that cutwork could be bought in separately. The parts of the set here discussed belong among the finest pieces of lace of the first half of the 17th c. in the collections to which they belong. And the fact that they constitute a set makes them virtually unique, since only single pieces have normally survived.